15 - Tennis, his favorite sport. At age 64, Williams accepted an invitation to teach theology at Regent University in Virginia Beach, Virginia. It was a position that he would hold for the next eighteen years. Both Williams and Jo enjoyed traveling, especially to countries and sites that related to biblical history. Some of their travels were side trips when he attended meetings. Others were in May (soon after graduation ceremonies and before flight rates went up for the summer). While in Virginia, Williams and his wife chose to live in an apartment complex that had four well-kept, lighted tennis courts. 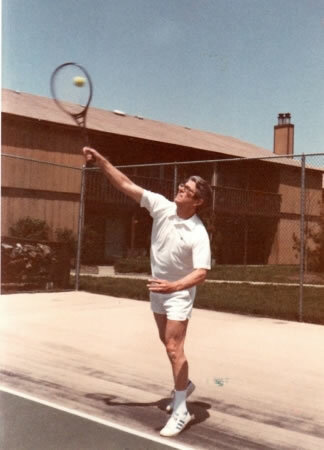 If it was not rainy or freezing weather, he and Jo played tennis almost every early morning or late afternoon (either as opponents or together against another couple). They also enjoyed the beautiful beach nearby, often joined by their daughter and her husband and granddaughter.